Fargo – Arriving at Nativity Church for a Saturday morning interview, I find Rebecca Raber, Shanley High School choir director, in the sanctuary just to the right of the altar and large, metal crucifix that dangles midair. Natural light falls from ceiling windows, softly illuminating the music corner where she and a student are rehearsing. As I slip unnoticed into the back pew, the student plays a moving piano rendition of “A City Called Heaven,” trying to decide whether he’ll accompany or sing it in his final performance of the song at an upcoming concert. “It’s up to you; just let me know,” Raber says, understanding the weight of his decision. He’s a senior, after all, and this song has become something of an endeared theme to the choir. As he plays, Raber begins singing, her back to me, and I find her voice hauntingly beautiful. I’m a little embarrassed by the tears dripping down my cheeks, but there’s no stopping them now. My soul has been awakened by music. It’s the first question I ask. I’ve often wondered if artists who teach feel the loss of not performing as much themselves. Besides, she loves the process, the planning, even the rehearsals. “That’s the fun for me,” Raber says. During a phone interview later, her husband, Michael, affirms what seems a rather unique drive for someone so musically gifted. Her sweetheart from their University of Jamestown days (then Jamestown College), Michael knows well how much she puts into her work, including summers poring over potential pieces, all tailor-chosen for the coming year’s unique voices. This strong work ethic emerged during her childhood on a farm near Pisek, N.D., where she was raised the fourth of five children. Raber started down the road of music in eighth grade as a trombone player and vocalist. “I took about a year of piano, but I was terrible,” she says. The music program at her school was almost nonexistent until Darla Sheldon, an instructor from Park River, walked in and saved the day, greatly impressing a young student known then as Becky Lovcik. Ever since, she’s been keenly aware of the tie-in between music and spirituality, which is evident in all kinds of music, not just sacred music, she says. “Whether you choose to recognize spirituality in your life or not, you are still a soul. And I think there’s a way God taps you on the shoulder through music that makes you stop in your moment,” she says. Raber says she enjoys bringing disparate people together and helping them produce something beautiful that they could not have accomplished as individuals. Though she’s taught at the college level, too, she finds the richest, most fulfilling opportunities in younger grades. Nick Kasper, a 2010 Shanley graduate, first had Raber as an instructor in sixth grade, and credits her for having inspired him to pursue music in college. “She helped us see that music can have a profound impact on us as individuals, and she used music to help us express ourselves and profess our faith with all the different texts we sang,” he says. Bethany Loock, a Shanley junior, says Raber encourages her students to sing from the heart, in part by taking time to really teach them the meaning of the songs they sing. But the students aren’t the only ones who admire Raber. 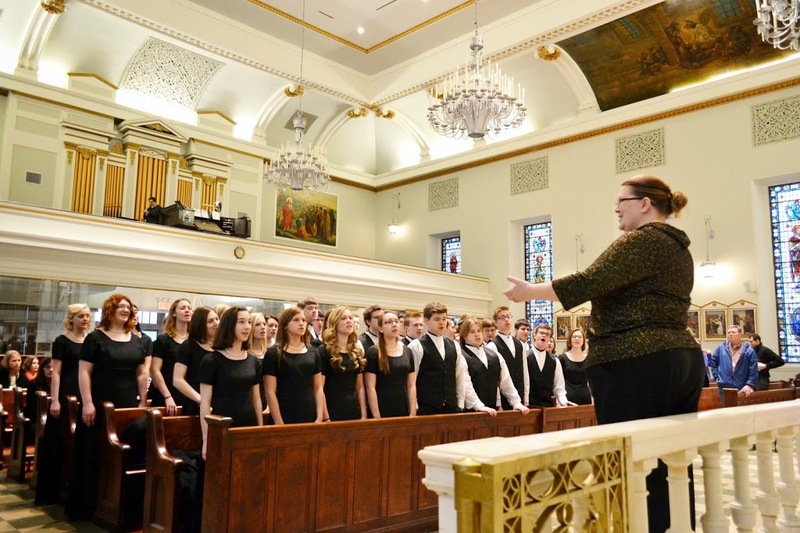 Maria Hennen, mother of two Shanley choir students, Alex and Hannah, recently volunteered as a chaperone for the group’s spring tour to New York City. What she witnessed only fortified conclusions drawn before the trip. But Raber squirms at compliments. She wants it to be about the students, she says, and quickly points out a few imperfections. For example, though she’s not one to raise her voice, she admits to having mastered her scrutinizing eye – “the look” – in order to return order to a boisterous class. Raber just giggles along, knowing someday they’ll see how well those life lessons have held and realize the profundity of the gift of music. Nice article on the music teachers. Teaching, especially in the arts, is a spiritual experience.